As many of you know, my dad suffers from MS, and has done so for more than 20 years. We were given great hope this year with the announcement of “The Liberation Treatment.” The process of opening the neck veins that was invented by an Italian doctor named Paolo Zamboni has caused great debate because it hasn’t been tested in North America, but the MS Society of Canada has promised to help fund the investigations. This year, Brent, Oliva, Richard and I—Team Zamboni—will be riding to help the process along. We are bicycling 125 k (!) on June 26 & 27 in New Brunswick. We’ll be riding for my dad, and for one of my 23-year-old students who was recently diagnosed with the dreadful disease. You can help us! Please, won’t you help us?! at the “register. login. pledge” option in the upper left-hand part of the page, click, “sponsor a participant”. In the “search” function, type in our team name: “zamboni”. You will be sent to a page where you can sponsor one of us or our team. If you give at least $20, I will send to you a one-of-a-kind handmade, reversible shoulder bag made of recycled material. If you give at least $40, you can have your choice of a single colour handmade, lined yoga mat bag. If you donate at least $45 to our cause, I will send you your choice of a patch work handmade, lined yoga mat bag. Look through the pictures I’ve posted below. Choose the bag you want, and send me an email (ddrs@ns.sympatico.ca), noting the bag you want with its number. Be sure to send me your postal address, and I’ll get your bag out to you right away! I want to publicly thank Lindsey Bellfontaine (LuLu), who designed the bags, and who donated many, many hours to help me sew them. We used recycled material that LuLu provided, and both of us used our grandmas’ sewing machines to make these bags with love. Thank you, Livy, for sewing some of the bags together. Thanks also go to Linda and Jasmine for donated material and time. 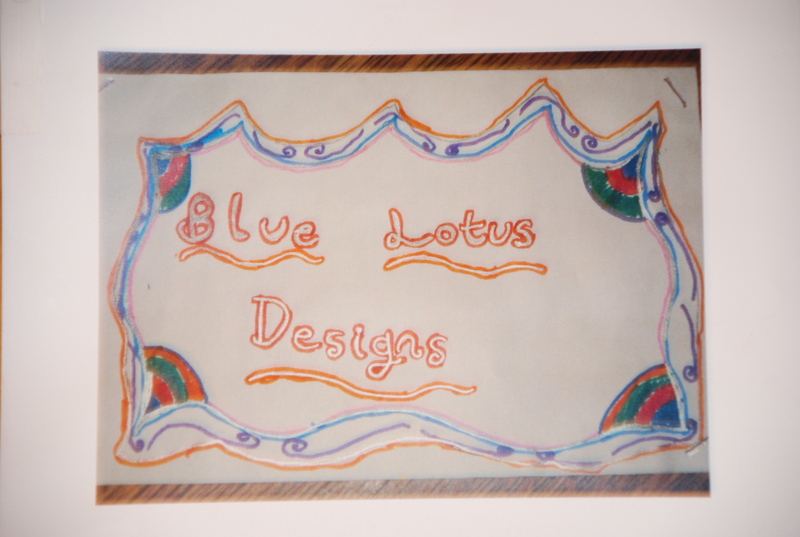 Jasmine designed our logo, Blue Lotus Designs, which you’ll see below. My friend Carole Burnett of Island View Design made us a display unit so that we could sell some of the bags at our local farmer’s market. Thank you all. Together, we can end this crippling disease!